This beautiful, nice display stand is capable to accommodate more than seventy pairs of wired earrings, as it enables you to put both earrings of a pair through the same hole. This way, you can take advantage of the space, to keep your collection of earrings organized. 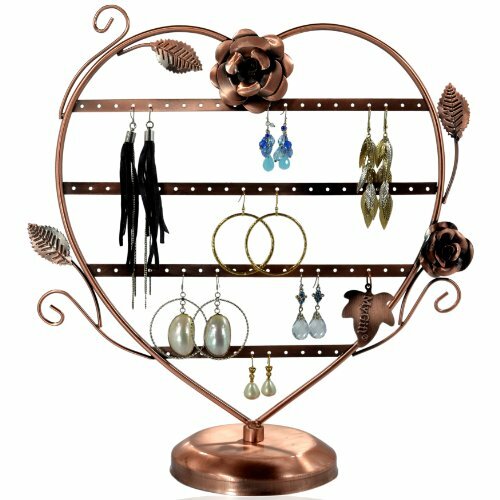 It is now so easy to keep your earring collection organized and in sight, with this Copper Color Heart-Shaped with Roses Earring Holder. This looks excellent in any store or room, due to its stylish, modern design. It features a heart shape, which gives a sophisticated and lovely appeal to the ambience and to the earrings that you showcase on it. It is built of solid metal, so you it is a durable piece to use for a long time. 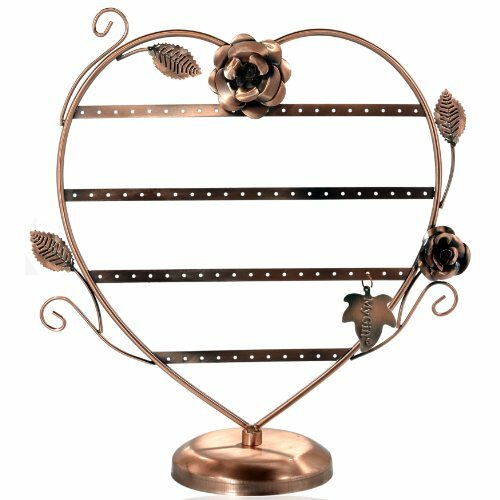 It measures 11”W x 13 1/2”H and it features a wonderful, copper finish, which gives a vintage look to this earring display stand. The display stand is adorned with rose vines, which offer a more sophisticated and exquisite look to this display stand. Once you display your favorite earrings on this stand, they will become visible to you and to your potential customers. Depending on the type of earrings that you want to showcase, you can place them two in a hole, or a single earring in a hole. This earring display stand features the shape of a heart and it is complemented with a solid, rounded base. This gives a great stability to the display stand, so it won’t tip or fall when in use. Bracelets can be hung from rose vines.